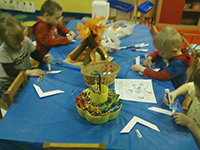 At Zion Lutheran Preschool, the focus is on your child’s primary areas of development: language arts and literacy, mathematics, science, social and emotional development, gross and fine motor development and character education. All our activities incorporate learning experiences that strengthen memory, hand-eye coordination, and perceptual development. We teach and reinforce colors, shapes, sizes, numbers, letters, and writing. In addition to a comprehensive curriculum, our children learn of God’s love for them in Jesus Christ through Bible stories and a chapel service during the school week. Your child will learn many things in a warm and loving Christian environment. To provide academic experiences in preparation for kindergarten. To encourage each child to grow in the faith of Jesus Christ as his/her personal Savior. To touch the lives of both Christian and non-Christian children and their families. To encourage parental involvement in their child’s development.